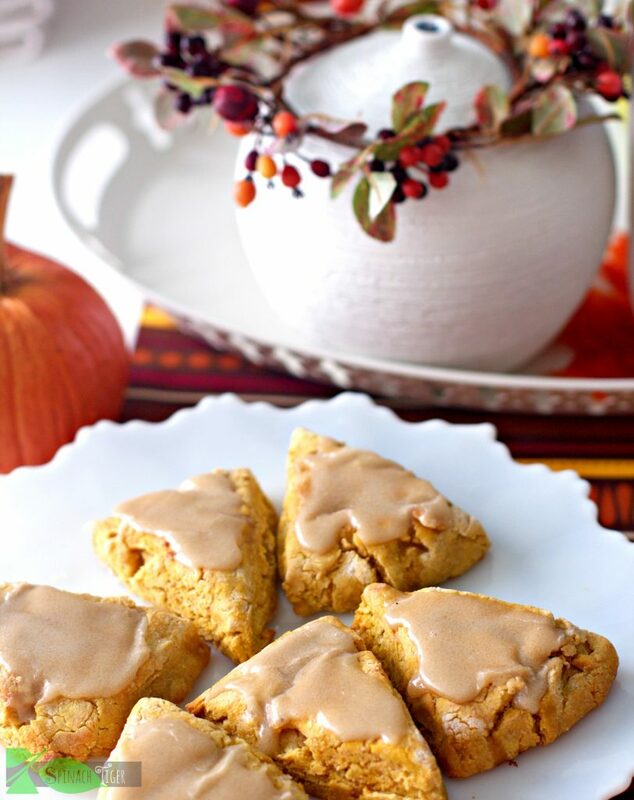 Gluten free pumpkin scones recipe with maple glaze. Mix gluten free flour, baking powder, sea salt, pumpkin pie spice and ½ cup sugar in a bowl. Cut butter into small cubes. Freeze for 15 minutes. Mix into the dry ingredients. Mix pumpkin egg, milk, pumpkin puree. Mix the pumpkin puree mixture into the flour mixture. Bring together to form a round of dough. Pat down. Put confectioner's sugar in small bowl. Mix maple syrup and melted butter together. Add i slowly, not adding all in. Only add until you have the consistency you want to drizzle onto the scones. If you think it's too runny, add more confectioner's sugar. Put glaze on while scones are still hot. Heat butter. Add in confectioner's sugar and maple extract. Mix well. Drizzle on scones while scones are still hot. IMPORTANT: Cool completely before eating. Note: You can make your own confectioner's sugar if you have a Vitamix.